An awesome bit of hardware. With bullet-proof build quality and intuitive control, it's a no-brainer. Fast reacting, soft knee, fully analogue FET design. Oversized backlit VU Metering. Variable wet/dry mix for perfect tuning of overall process. Would be nice to have a solo option on each band. Drawmer is hardly a beginner when it comes to producing hardware compressors. It has had huge success with its 1960 and 1968 models and rightly so - these would both be fine additions to anyone's rack. But these standout products are single-band compressors so how will its new multi-band model compare to these more traditional products? The 1973 actually borrows from a discontinued multi-band that Drawmer used to produce called the S3. This differed in the sense that it was a vacuum tube compressor but it had a similar format. The real difference here is price - the S3 was a lot more expensive. Multi-band processors are often more expensive, which makes the price of the 1973 a surprise. "This is not only a great multi-band compressor but one of the nicest hardware dynamics processors we have used in some time"
So down to the basics. As you might expect from Drawmer, the build quality is exemplary. It's 100% metal construction, the knobs feel as if they would survive a nuclear blast and the switches give a satisfying clunk when operated. Seriously though, it is solid and obviously built to last forever. The 1973 is a three-band compressor with each band clearly separated by two sweepable crossovers. Essentially, you set the high and low band frequency and the mid band is decided by these two points. Once set, each band can be muted or bypassed, which is great for hearing things in isolation. It would have been awesome to see a solo option on each band but this is about our only criticism here and it's really splitting hairs. Overall the front panel is laid out clearly with bold graphics and a decent amount of space between controls. Threshold settings are controlled using oversize knobs, which is great for quick tweaks, and key switches are partnered with bright LEDs for quick feedback on your current settings. The VU meter is also a bit of triumph; it's bright, very large and can be switched to show peak and VU readings at two different levels. The 1973 was a joy to use. We were able to put it to work treating everything from individual instruments to drum busses. And it performed flawlessly during mastering sessions as well. The fact that the 73 features FET compressors, as opposed to vacuum tube models, means that it can work very quickly and also retains a certain transparency, even when working at full tilt. What makes the 1973 really standout is its pure musicality. The crossovers curved are just right and much more forgiving than some multi-bands we have used. Isolating the individual bands gives you a perfect idea of what you are working on without sounding too abrupt. There is also a welcome mix control allowing you to dial in some of your original untreated mix. This is perfect for more creative applications or when working with your master buss. All this control allows you to grapple with even the most unruly bass parts or over-zealous drum mixes. On the other hand the 1973 is capable of imparting a subtle level of control across the mix that adds a tightness that any single-band counterpart would struggle to reproduce. An attack, release and gain control on each band means that your set-up can be finely tuned. Couple this with three independent gain reduction meters and you should have no problem in getting the perfect sound. As if all this wasn't enough, the 1973 has a few extra tricks up its sleeve. On the low band you'll find a 'Big' control and on the high band an 'Air' switch. These seem to act as enhancers and add a larger than life effect to proceedings. We were dubious at first but at the end of the day we found ourselves leaving them engaged constantly! This is not only a great multi-band compressor but one of the nicest hardware dynamics processors we have used in some time. 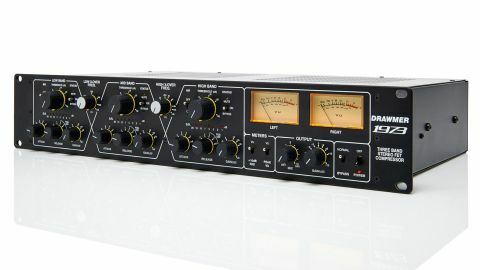 If you are in the market for an analogue compressor, you might want to check out the 1973 and get three bands of awesomeness for the price of one. Top job from Drawmer.